Corners For Wildlife is a program unique to Nebraska that establishes permanent wildlife habitat on center pivot irrigation corners. 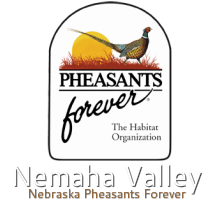 This program is driven by funding and commitment from local Pheasants Forever chapters, the Nebraska Environmental Trust (NET), Nebraska Game & Parks Commission (NGPC) and local Natural Resource Districts (NRDs). To date, this program has been awarded grants from the NET totaling $3,727,000. Landowners enrolling in the program receive 75% cost-share assistance from Pheasants and Quail Forever chapters for the cost of seed and wildlife shrubs and a 5-year rental payment of up to $100 per acre each year, depending on the cover ractice selected. NET and NGPC funds are applied solely to pay for landowner rental ayments. The participating NRD plants the trees for free when the landowner selects 400 or more trees or shrubs for the project. Enrolled a total of 1,429 cornersacross the state. Planted 436,510 trees and shrubs. Created 9,500 acres of nesting cover. Applied 699,320 feet of fabric weed barrier to tree plantings. Received over $672,500 from local Pheasants Forever chapters in cost-share payments. If you are interested in enrolling in the Corners for Wildlife Program, fill out the Notice of Interest form and mail it to the address listed.